Paterno Monday was a long day in the La Citta campaign office. The organizing committee was trying to get as many planes in the air as possible, but it was not an easy task. As a new organization there were the usual tensions of learning what to expect from each other and missteps in different directions as both program and practice struggled to align. Having listened hard all day and navigated my way (poorly!) through Italian, I was finally able to contribute a detailed 2-page checklist of tasks that needed to be done and decisions that needed to be made, but at 1030 pm, I punched out and headed for the crash pad, since I was little more than a bystander in the often heated discussion in the cold office. 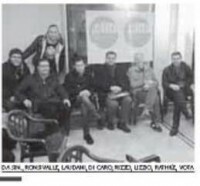 It was a fun surprise to be greeted at the coffee bar by one of the committee with a copy of the popular La Sicilia, widely read in the southern parts of the island, which showed a picture of several of the committee and me sitting before the La Citta sign. The article’s headline quoted Rathke as saying, “the people’s voice shall be heard.” What a hoot! I tried to read the article myself, and it seemed ok, but we’ll see what the committee thinks soon enough. New Orleans got some press and one guy was quoted who always calls me the “American” because it is difficult for Italians to pronounce “Wade.” There is no “w” in Italian. It took me sometime to remember enough of my high school Latin that “vir” which means man in Latin for example was pronounced as if the “v” were a “w,” but there was no “w.” My daughter, Dine’, and the Canadians who enjoy calling me “wadee” after the African pronunciations would be having a field day with the new twists on “wade” here in Sicily, but they’ll get no help from me! Exciting to get an attachment from ACORN India’s Vinod Shetty of an article from the Indian edition of People Magazine naming our Dharavi Rock project a “people’s hero!” The internet connections are terribly slow, but I could see an excellent picture of Vinod and read enough about our collaboration with Blue Frog to know this was a good one. Enjoy the article at http://www.acorninternational.org/images/ACORNIndiainPeople/acornindia.pdf I’m still trying to download it myself and read the rest! This entry was posted in ACORN International and tagged Blue Frog, Civic Movements, Dharavi Rock, India, La Citta, La Sicilia, Paterno, Vinod SHetty by Wade. Bookmark the permalink.